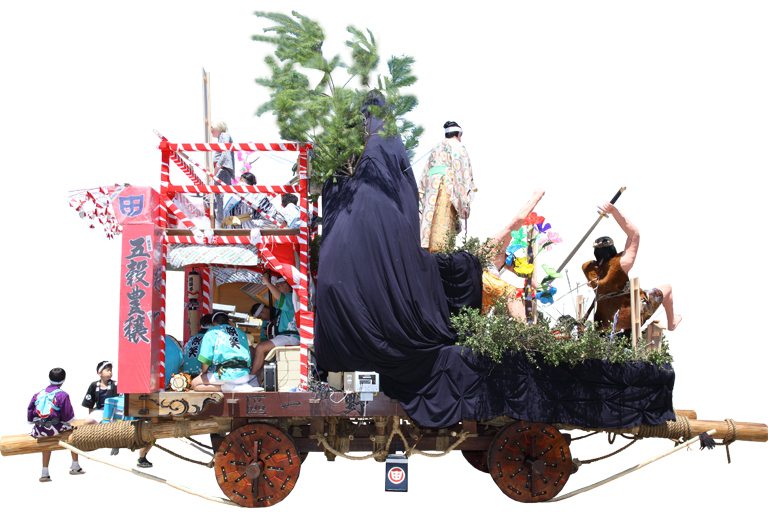 There is also the theory that Hikiyama is a place where God descends and lives and drives away evil by dismantling after the festival is over. 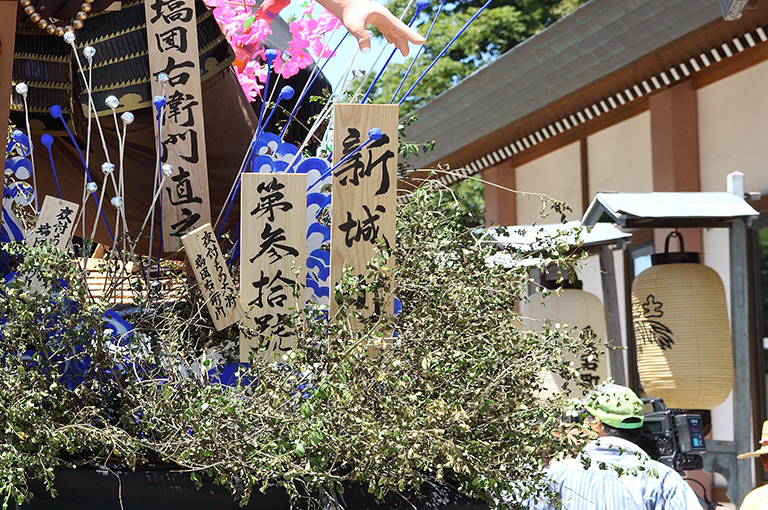 On the other hand, the Hikiyama Festival leaves behind a remarkable element of the taste.They decorate Hikiyama as beautifully as possible. Hikiyama has a taste for enjoying the audience’s eyes. 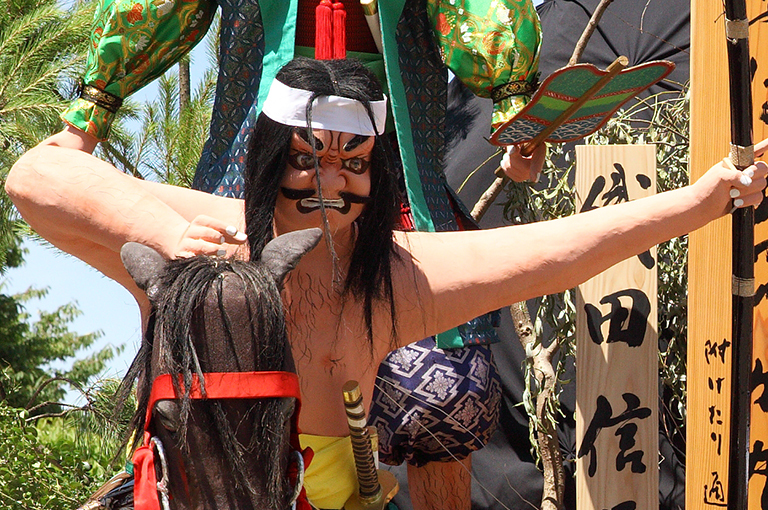 One feature that strongly attracts tourists is the assembly of dolls on the float: some are dressed as samurais (musha) and some are naked. 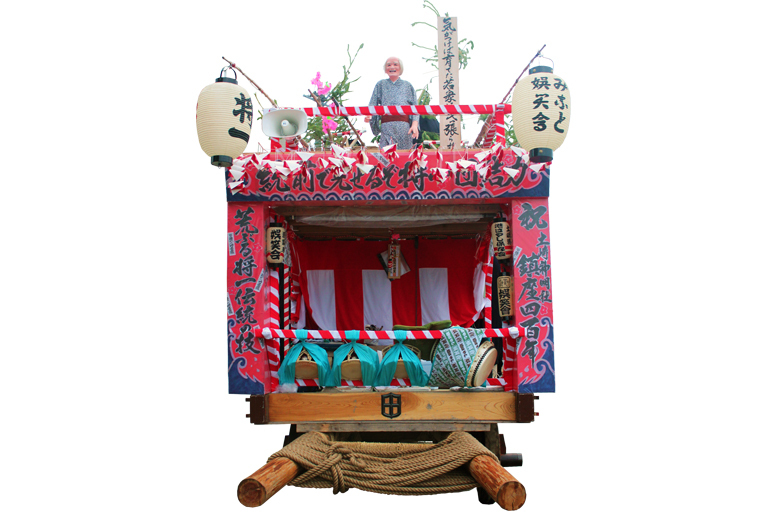 One float typically has two or three dolls depicting a scene from a famous battle or other historic event. 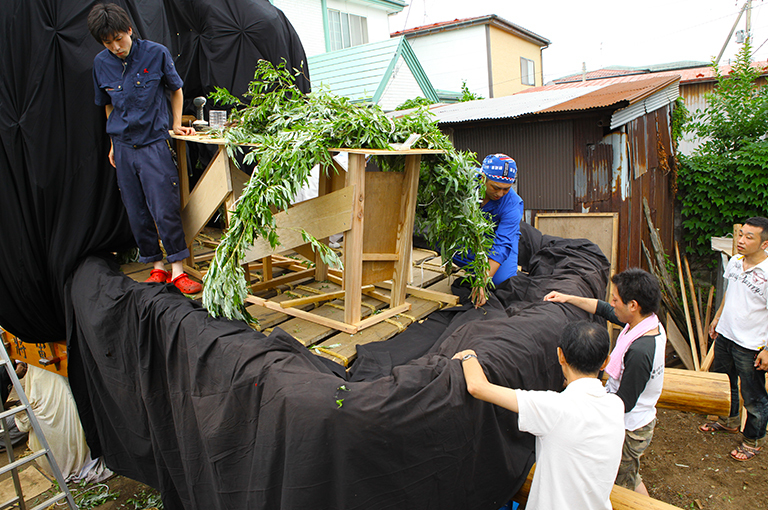 The 140-year-old Echizenya Doll Shop is now the only dollmaker which can build the float dolls. 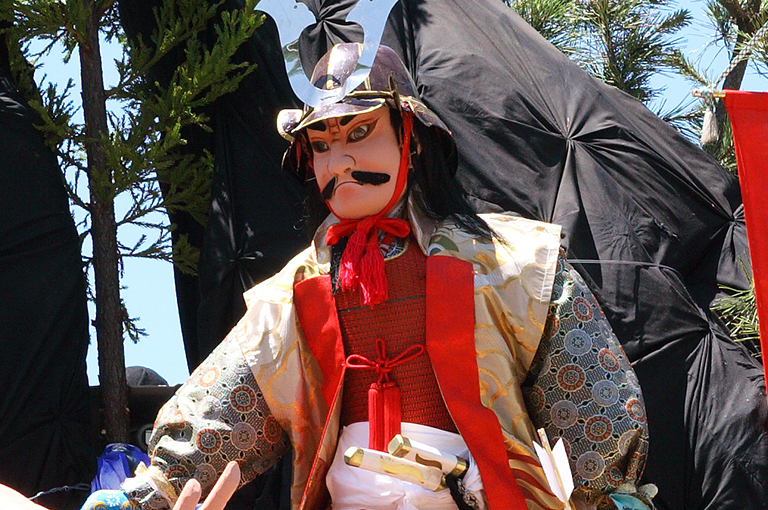 What kinds of dolls to use to decorate their float is a major decision for the float teams, and is an important element of hikiyama success for each neighborhood. 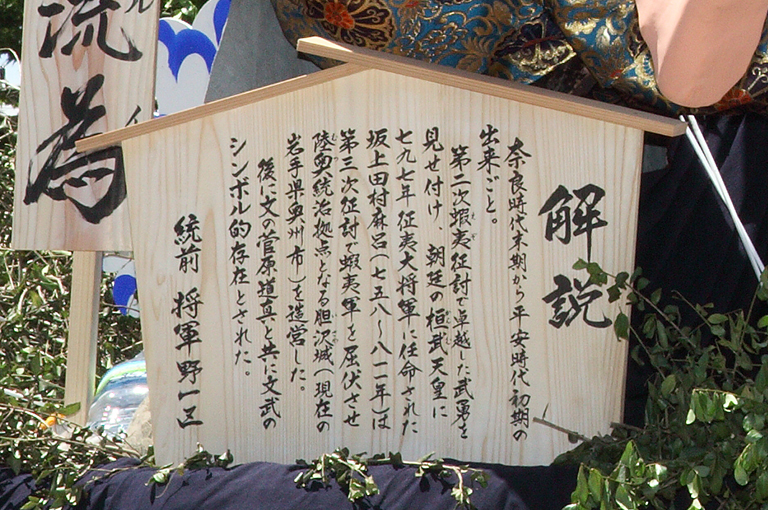 A tag naming the scene which is depicted by the hikiyama. 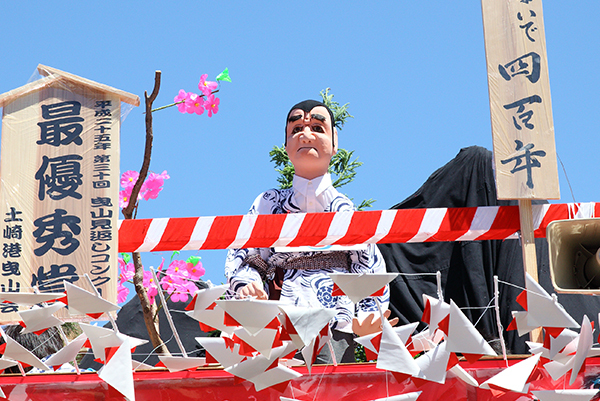 A tag naming the individual float dolls. A tag naming the neighborhood to which the hikiyama belongs. 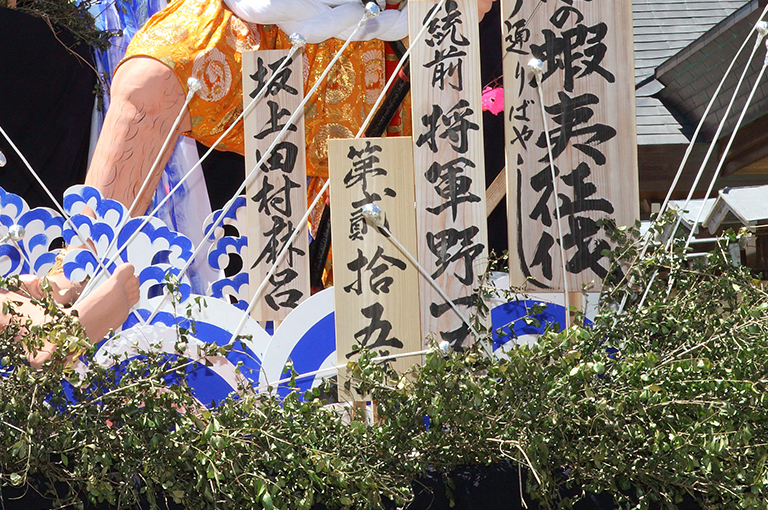 A numbered tag showing this hikiyama’s place in the procession. However, “four” and “nine”, the two unlucky numbers in the Japanese language, are skipped in the sequence. 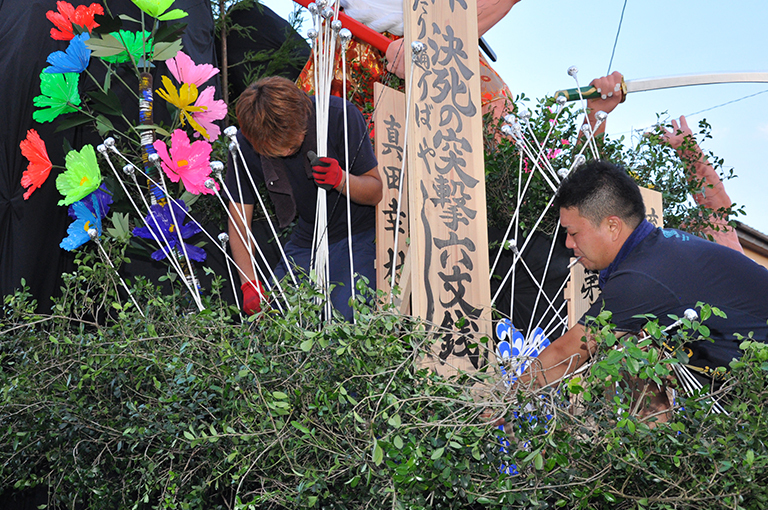 Some neighborhoods may additionally fix a tag giving a more detailed description of the hikiyama scene. Typically, branches of Tsuge tree are arranged around the doll-supporting bowl and also pine branches in between the rocks. 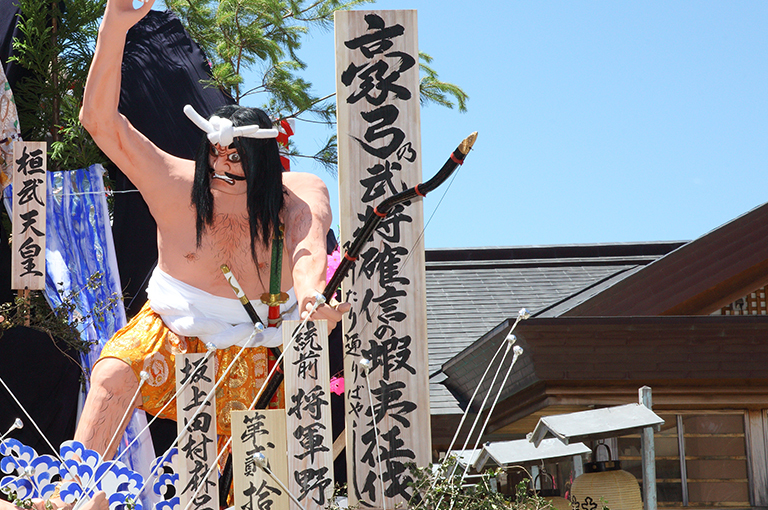 Beside the rocks, another type of pine branch decoration called “streaming pine” is arranged. 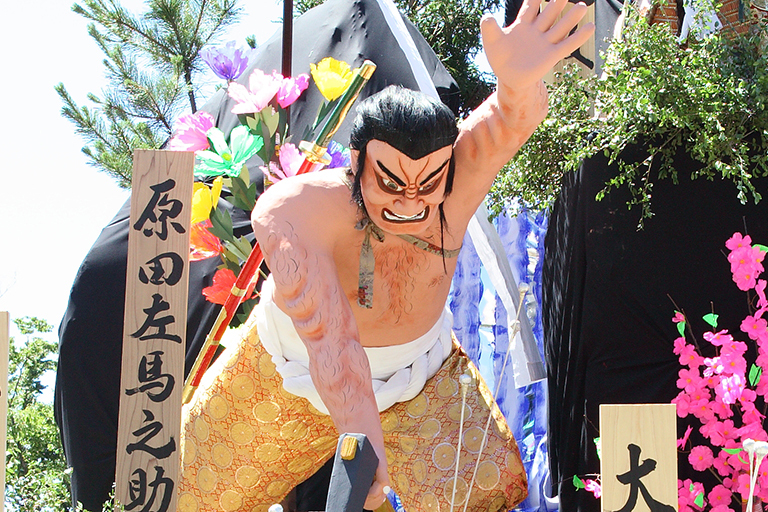 The appearance of “rocks” on the float is an important aspect of the hikiyama aesthetics. To create a realistic rock texture, people bundle leafless willow branches and tie them over wooden frames. 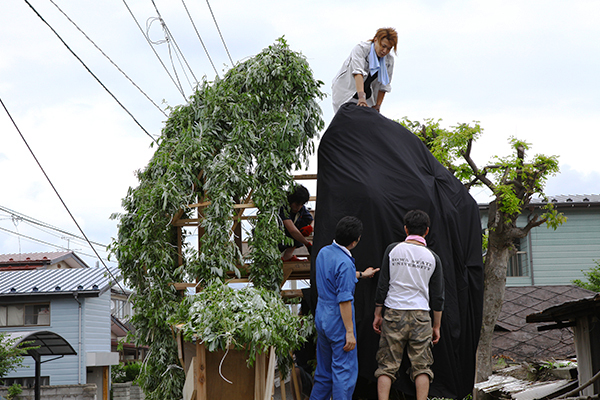 Over this assembly, a black cotton fabric tied in places from inside is fitted, thus depicting the bumpy texture of rocks. Each float has a pair of rocks, one rock being male and the other female. Between the rocks is an assembly of fabric depicting a splashing waterfall. The base on which the dolls are installed. In addition to the largest bowl at the bottom, smaller bowls may be used to raise individual dolls. 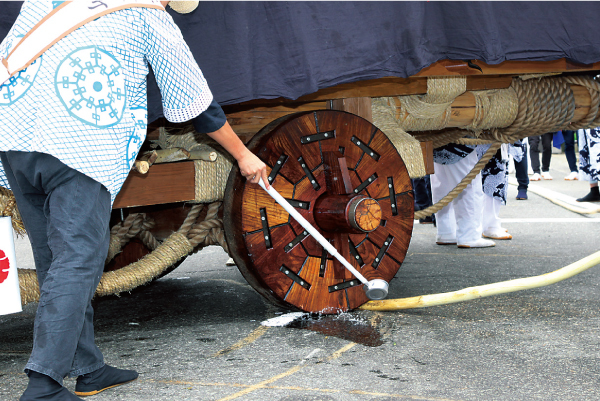 One major characteristic of the hikiyama float is that its wheels are entirely made of wood. 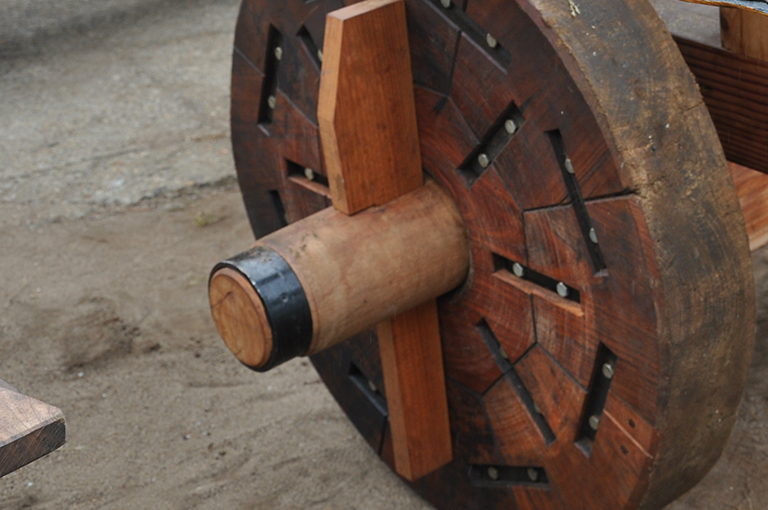 To reduce the friction of these wooden wheels, lubricating oil is poured over the wheels as the float is pulled along. 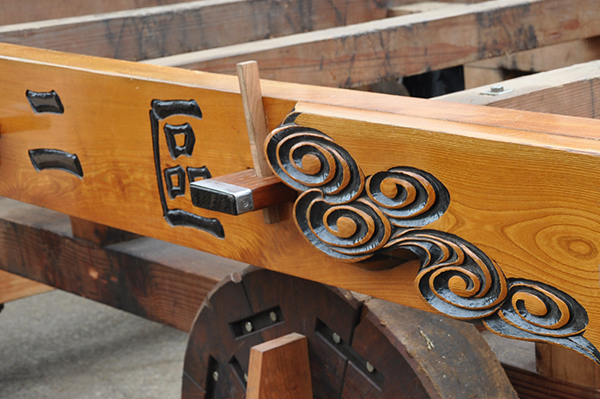 An important wooden rod that supports two wheels and supports the rotation of the wheel. Outer frame for fixing the wheel / Shinbo after assembling it with a beam or a frame. It is also commonly referred to as a cloud board because town names and town patterns are carved, and four corners are decorated with arabesque patterns. 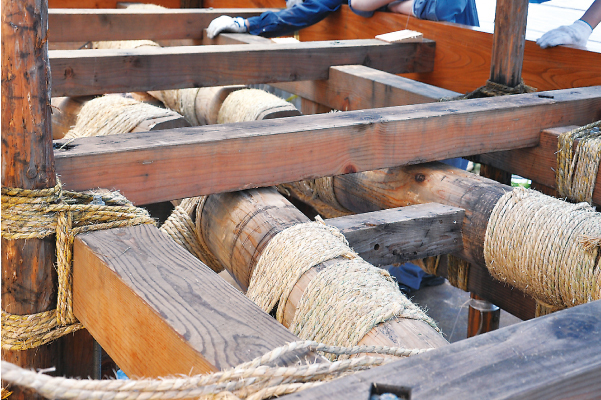 A log that wraps a rope that tow a Hikiyama. Two pieces are attached to each of the doll side and the music piece side. 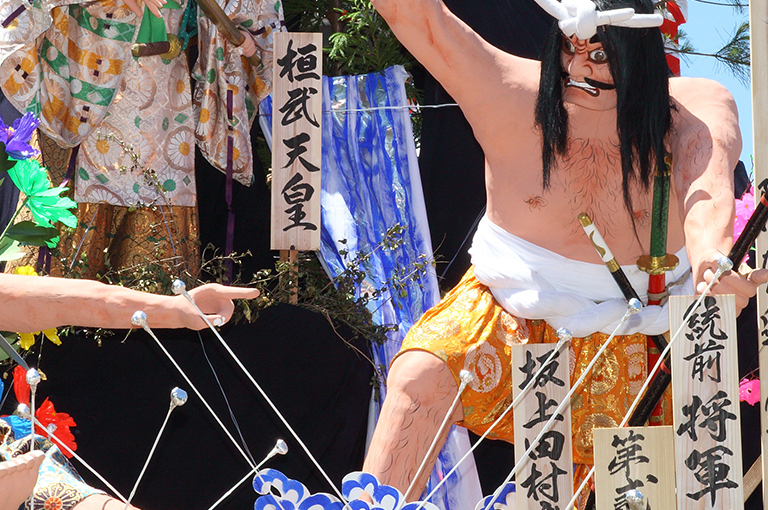 The attachment of the spear is called “spear-out”, especially the way of swinging is the center and involves the work. 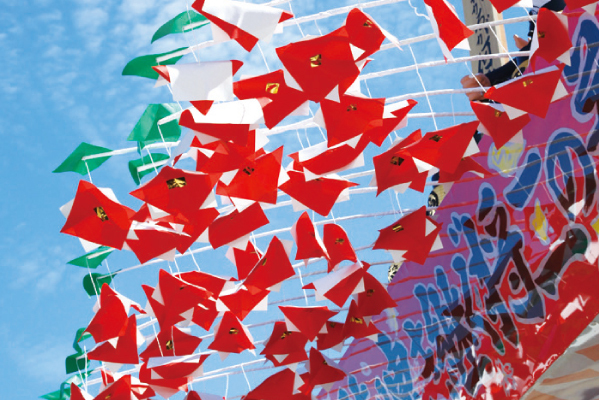 The square lanterns, colored primarily in red, bear the name of the neighborhood, along with auspicious phrases and a description of what is special about the neighborhood. The color and the writing add to the fun and excitement of the festival. The square lanterns are attached to and surround the music band stand and will be adorned with square flowers on top. 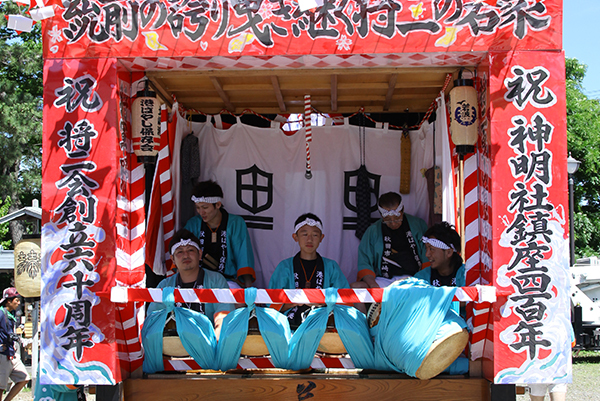 There is a drum attached to the music tower, and some of the musicians can get in and play it. On the backside of Hikiyama, on top of the music tower, there are tags written with phrases called reflections reflecting the possible society in the town and a looking doll symbolizing it. 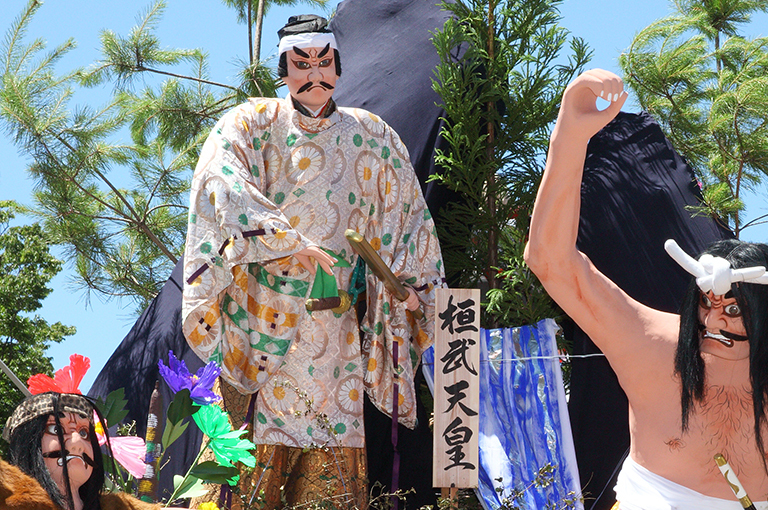 Unlike Mushier dolls and bare dolls, it has a comical look with satirical effect. 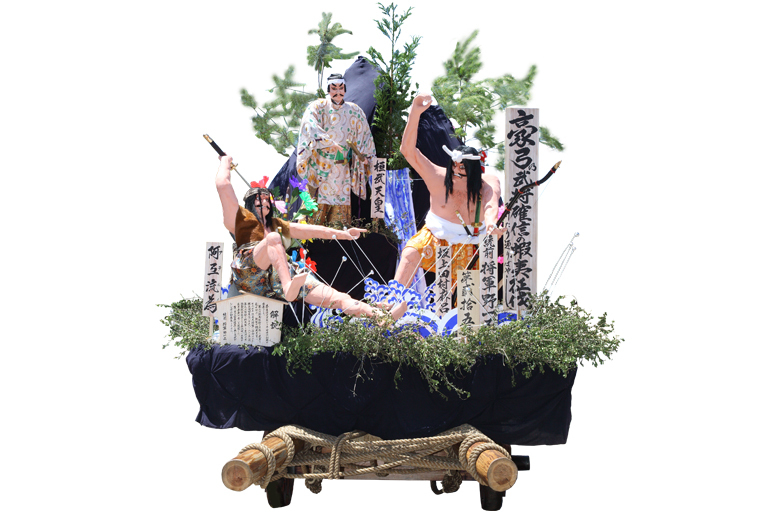 Mikaeshi set is entered into the Mikaeshi Competition organized by the Tsuchizaki Minato Hikiyama Committee. The top prize is awarded to one neighborhood and the second prize is awarded to two neighborhoods. 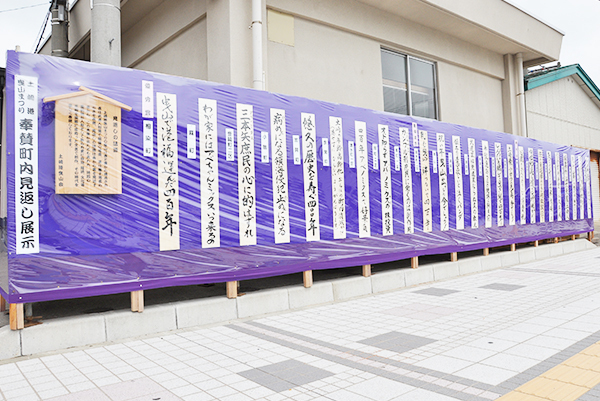 The winner neighborhood is given a victory tag, which will be displayed alongside their Mikaeshi poem during the parade.Every year,Mikaeshi in each town is exhibited at Tsuchizaki station.